At the outset of this paper which is focusing on the ethics of how we, as humans, treat and interact with each other, I’ll begin with a story which I feel is an excellent example of human kindness. I also have to qualify this paper in that while this is for an ethics class in philosophy, I am working towards a dual degree in philosophy and religious studies, thus there is overt religious language ahead. After getting my coffee I looked around and saw that the only available spot was the counter, a shelf really, which is in the window facing 6th Avenue. And as I stood there sipping my two dollar cup of coffee, which cost more than what I put in the man’s bucket, it felt odd; I felt a little guilty. With his back to me, this man was sitting on the sidewalk directly in front of me and the only thing separating us was a thin pane of glass. Yet I was on the inside and he was out in the cold. The biblical passage where Jesus was instructing his disciples how to treat strangers (and how they unknowingly treated him) came to mind, “For I was hungry and you gave me something to eat, I was thirsty and you gave me something to drink, I was a stranger and you invited me in, I needed clothes and you clothed me, I was sick and you looked after me, I was in prison and you came to visit me” (Matthew 25:35-36, NIV). There was a food cart on the corner of the street, and as I looked out the window sipping my coffee I could see another man talking with the vendor and also looking over at the man on the sidewalk. A minute later he walked over to the guy sitting on sidewalk, and in his hands were hot dogs and sodas, but what happened next brought tears to my eyes. At first I thought he was simply buying food for the guy, but what he did then really amazed me. He sort of knelt down and said something to the man; I of course couldn’t hear him as I was safely ensconced on the “inside.” Then, after a moment, he sat down next to the guy and they both ate their hot dogs together, right there on the cold sidewalk. He did more than simply feed him, he sat with him, saw him as an equal, and gave him dignity. There are more than 1.6 million people living on Manhattan Island but on that day I saw these two lives converge, and it was beautiful. In a way they were communing together as two souls; the bread they broke were the hot dogs, the wine they drank was soda, and the altar was the cold New York Street. I wanted to tell this story because I feel what I really saw that day was love in action, and that’s what life is really about isn’t it? Connecting with one another and taking care of each other. The writer and philosopher, Peter Singer, argues that this is not something that is a casual occurrence, but that it is our duty as fellow humans, “Effective altruism is based on a very simple idea: we should do the most we can. Obeying the usual rules about not stealing, cheating, hurting, and killing is not enough, or at least not enough for those who have the great good fortune to live in material comfort, who can feed, house, and clothe ourselves and our families, and still have money or time left to spare. Living a minimally acceptable ethical life involves using a substantial part of our spare resources to make the world a better place. Living an ethical life involves doing the most good we can” (Singer, 2016). Judaism: “Love your neighbor as yourself” (The Bible, New International Version, 2011). The lawyer must have thought for a moment, and realized that it would be easy for him to love God with everything he’s got so long as he doesn’t have to love all of his neighbors. So just to be perfectly clear, he asks Jesus his final question, “and who is my neighbor?” (Luke 10:29, NIV) to which Jesus replies by telling the parable of the Good Samaritan, which of course is the story of a stranger helping a stranger, and also another excellent example of human kindness, but even more importantly an example of how we should live. We as a species are hardwired to be caring and want to make a connection with one another. Scientists using advanced imaging technology to study brain function have found that the human brain is wired to reward activities such as caring for each other, cooperation, and service. Merely thinking about another person experiencing harm triggers the same reaction in our brain as when a mother sees distress in her baby’s face. But the act of helping another person triggers the brain’s pleasure center (Greater Good, 2017). In an age where sensationalism sells and good news doesn’t always make the news, the media likes to portray the world as a dangerous self-serving place, but this is not necessarily the case. “If the world seems to be a more violent and dangerous place than ever before, however, this impression is an artifact of the media. There are plenty of violent people, but for any randomly selected person today the chances of meeting a violent death at the hands of his fellow humans is lower now than it has ever been in history (Singer, 2016). Good still abounds all around us, sometimes we just have to look for it. That same cold winter in New York much of the country had a cold snap, even in unlikely places such as Georgia, and that’s where Dr. Zenko Hrynkiw was at the time. He is an accomplished brain surgeon and was at Brookwood Medical Center and had to travel to Trinity Medical Center, six miles away, to perform an emergency operation…but then the snow hit and Georgia was declared a state of emergency. The doctor knew that getting to the other hospital by car was not an option. He also knew that his patient had taken a turn for the worse and if he didn’t get to them soon and perform the operation they would die. Dr. Hrynkiw is not a spry 20 or 30 something, he’s not even 40 or 50; he’s in his 60’s. But knowing the facts at hand he didn’t hesitate. He did, what I believe is within each one of us; he set out to help. He walked the six miles with an overcoat covering his surgical scrubs, and booties still on his feet, and made it in time to perform the surgery and save the patient. Later, when asked to be interviewed he commented “he didn’t know what the big deal was, he only did what anyone would have” (NPR.org, 2017). So I ask again, who are our neighbors? Is it the person living in the next apartment, just beyond a thin wall? Sure, of course. But who else. How about the person you meet on the street? Or a co-worker. Dr. Hrynkiw certainly knew, and deep down so do we. I truly believe this. I recently finished reading an inspirational travel book by the journalist Mike McIntyre, The Kindness of Strangers, Penniless Across America. The gist of the book is the that author walked and hitchhiked from his comfortable home in San Francisco to the east coast. He did not bring a cent with him and would not accept money, nor would he ask for food or lodging. As the title suggests he was literally relying on the kindness of strangers. During his journey he found that most people just wanted to help one another, “Once again I am amazed at how often it’s the ones with little to eat who are quick to share their food” (McIntyre, 2014). A couple years ago I was working as chef at a private city club, “the second oldest club of it’s kind in the country,” its members like to proclaim. I would serve the “upper crust” of society while much of the kitchen staff was paid below living wages. Saw Tin was one such person, he was a dishwasher at the time, but prior to fleeing his native Burma he was an engineer. Though with little English skills this was the work he could find in America. I do not speak Burmese so we spent a lot of time pantomiming. He is about my age and was working to save enough money to bring his wife and adult daughter here. On one Monday morning he came to me with a wallet he had found on his way to work; it was on the sidewalk, he motioned. When I opened it, it contained more than $100 in cash and 10 credit cards. We turned the wallet over to the police who then contacted the owner. When she came to retrieve it she commented that everything was intact; nothing was missing. Saw Tin had full opportunity to take the cash and credit cards without anyone finding out, but he didn’t. The women asked to meet him so she could thank him. When they met, Saw Tin greeted her with clasped hands, a brief bow, and a soft namaste. Namaste is a Sanskrit phrase which loosely translates as, “my soul recognizes your soul” (Geno, 2017). But who is my neighbor? Saw Tin knew. Acts of kindness, big or small, can really make a huge impact on a person’s life. The basis of what the philosophers, especially Immanuel Kant, refer to as moral philosophy is moral action, and if I’m reading this correctly, this is how a person responds to the world. Kant also argued that the basis for morality is freedom (Palmquist, 2008). If this is true then we have the freedom to choose good action from bad. What I find interesting, and even a bit contradicting, in Kant’s theory is that while he was not necessarily a proponent of compassion (Greater Good, 2017), he also suggested that we listen to the small voice within each of us (Palmquist, 2008). To the philosopher this small voice may be the voice of reason, but to me I truly believe this to be the voice of compassion. The Epistle of James, which is one of the oldest books of the New Testament and is said to have been penned by James, the brother of Jesus, is really a small book of Christian ethics. Some say it is a blueprint for the way a Christian should live, “What good is it, my brothers and sisters, if you claim to have faith but have no deeds? Can such faith save you? Suppose a brother or sister is without clothes or daily food. If one of you says to them, ‘Go, I wish you well; keep warm and well fed,’ but does nothing about their physical needs, what good is it? In the same way, faith by itself, if it is not accompanied by action, is dead” (James 2:14-17, NIV). Richard Taylor in his book, Restoring Pride, suggests this inner knowing and selfless service are a sort rule of manners, and even though he writes of pride, he also argues that this is not pride but refers to it as considerateness, “Thus, the rule of considerateness has no connection with pride, but is a practical rule of manners. It guides you unerringly in your relationships to all other persons, whether they be friends, kin, or total strangers” (Talyor, 1996). By now you’ve likely gathered that I like to use stories, everyday events, as ways to illustrate my point. Well I’d be remiss if I didn’t comment on something that just happened. I was about halfway through writing this paper at a local coffee shop. My head was down and I was “in the zone” typing so I didn’t see the man approach until I heard his scraggly voice say “excuse me.” I looked up and there was a man in front of me who was not pleasant to look at. He was older, looked physically unclean, had a runny nose, and a small open wound on his face. He was asking for money. Here I am writing a paper about the Golden Rule, quoting Jesus and other sacred texts, and there is Christmas music playing in the background. Is this some sort of a test, I thought? I often give the homeless spare change, and stop and talk with them, but for some reason I was put off by how I was approached; he had a sort of aggressive manner. My first inclination was to say no I can’t. But then I thought to myself (the small voice within), can’t or won’t. I felt my pocket and there was no change, so I reached for my wallet and handed him a dollar. Seeing the loose bills in my wallet he asked if he could have another, I handed him another and as I did an employee came by and shuffled him out. I realized then that his aggressive behavior was likely that he knew he only had a brief moment before he was kicked out, time was of the essence. On their way back in the employee stopped by my table to apologize…apologizing for another human being. Who is my neighbor, I thought to myself? Philosophy, and even religion for that matter, in many ways seems to be about asking questions, and not necessarily having the answers. Plato, I think, sums this up articulately in his famous but simple statement in his Apology, where Sacrates proclaims “An unexamined life is not worth living” (Plato, n.d.), because I believe with self-examination comes growth, and with growth one realizes that they are not they only person that counts. There are so many questions which I do not have an answer, but there is one that I do: Who is my neighbor? The answer is everyone, but the difficult part is remembering this and treating each and every person the way that I would like to be treated. But this, I suppose, is what makes us human. In conclusion, I’ll finish with an eloquent quote from the stoic philosopher, Epictetus, from his slim but inspirational volume, The Art of Living, which I feel summarizes the entire premise of the Golden Rule: “One cannot pursue one’s own highest good without at the same time necessarily promoting the good of others. A life based on narrow self-interest cannot be esteemed by any honorable measurement. Seeking the very best in ourselves means actively caring for the welfare of other human beings. Our contact is not with the few people with whom our affairs are most immediately intertwined, nor to the prominent, rich, or well-educated, but to all our human brethren. View yourself as a citizen of a worldwide community and act accordingly” (Epictetus and Lebell, 2007). Epictetus and Lebell, S. (2007). The art of living. New York: HarperOne. Geno, R. (2017). The Meaning of “Namaste”. [online] Yoga Journal. Available at: https://www.yogajournal.com/practice/the-meaning-of-quot-namaste-quot [Accessed 25 Nov. 2017]. Greater Good. (2017). The Compassionate Instinct. [online] Available at: https://greatergood.berkeley.edu/article/item/the_compassionate_instinct [Accessed 21 Nov. 2017]. The Holy Bible, New International Version. (2011). Grand Rapids, Mich.: Zondervan Bible Publishers. McIntyre, M. (2014). The kindness of strangers. [Charleston, SC]: CreatSpace. NPR.org. (2017). Brain Surgeon Walks 6 Miles Through Storm To Save Patient. [online] Available at: https://www.npr.org/sections/thetwo-way/2014/01/31/269380564/brain-surgeon-walks-six-miles-through-storm-to-save-patient [Accessed 23 Nov. 2017]. Sacred-texts.com. (2017). 1:12: Anas: The Prophet said, None of you will have faith till he wishes for his …. [online] Available at: http://www.sacred- texts.com/isl/bukhari/bh1/bh1_11.htm [Accessed 23 Nov. 2017]. Sacred-texts.com. (2017). Sacred-Texts: Hinduism. [online] Available at: http://www.sacred-texts.com/hin/maha/ [Accessed 21 Nov. 2017]. Sacred-texts.com. (2017). Introduction and Preface. [online] Available at: http://www.sacred-texts.com/tantra/maha/maha00.htm [Accessed 23 Nov. 2017]. Tao Te Ching. Acc6.its.brooklyn.cuny.edu. (2017). Tao Te Ching. [online] Available at: http://acc6.its.brooklyn.cuny.edu/~phalsall/texts/taote-v3.html [Accessed 23 Nov. 2017]. Precarious. That’s the word that came to mind this morning when thinking about the times in which we live. That could also have been a good descriptor of my emotional state as I rode my bike to a coffee shop. Has the world and everyone in it gone insane? There is just so much darkness. So much disconnect. Yesterday’s shootings are just the tip of the iceberg; just one in many destructive things that are happening as I type these very words. And then I came upon the scene pictured above. An apartment on South Elmwood Avenue here in Buffalo with a table out front on the sidewalk. A few odds and ends; nothing of any real value. But rather than throw them in the trash they took the time to set up a table, lay the items out, and make a sign…Peace; Free Stuff. They took the time to offer this stuff to someone who may need it. It brought a smile to my face then just as it does now. And it made me remember that there is still good. Our society is seriously broken. And by “our” I don’t just mean American. We really need to do something, but what? What can we as individuals do to make a difference? What came to me was that we as individuals do need to wage peace at a personal level. Simply being nice to people in your own little world, regardless of their gender, skin color, or religion. Help people whenever you can. Maybe it can have a ripple effect. I really do worry about the next generation, my son’s generation. And his children’s generation after him. And I’d be lying if I didn’t say I am waiting for the next MLK or Gandhi to appear to inspire us into a revolution, to change things and turn us around to face things differently…to wake us up. Though I’m not sure we’d recognize the next prophet if they did appear on the scene…we don’t have enough space for them. But I also think how it can be us. It can be us to make small changes each day to make ourselves as a society that much more…well, societal. If we did this maybe it would stop that one person from doing something terrible. Maybe it would stop that one single person and make them think that they shouldn’t do the terrible act they had in mind. Maybe it would soften their heart enough to see the consequences. Maybe it would make them realize that they are loved and they themselves can in fact be love. And if our kindness changed even one single person that would be enough. But then maybe it would have a ripple effect. We, as collective consciousness, really need to look within. It’s not us against them, or vice versa. It’s just us, the people of planet earth. We really need to do this if we want to survive. And this is what I was thinking when my heart was warmed when I saw a little table of things out that were offered free for the taking as I was riding my bike to a coffee shop on a grey and chilly December morning. This post is a continuation of one I wrote nearly a month ago regarding the homeless in our city (click here to read it). In that post I mentioned witnessing a women being verbally abused while asking a group of young party goers for some spare change, and also of a man I spoke with who asked me for money on a sunny Sunday afternoon. He told me that he worked full-time (for minimum wage) but still had to beg on the street to support himself. The image above is of Sarah. I met her today while out on my bike. When I saw her sign it was as if my bike stopped itself. After giving her some cash she seemed a bit apprehensive when I asked her if I could take her photo. I told her that I have a blog, work as a chef, and am also an interfaith minister…she then looked at me like I was a bit crazy (and rightly so). Anyhow, we both relaxed and we had a nice but brief chat, this is her story. She’s a single mom just as the sign reads. She and her daughter are currently squatting in an undisclosed vacant house with a few other people. 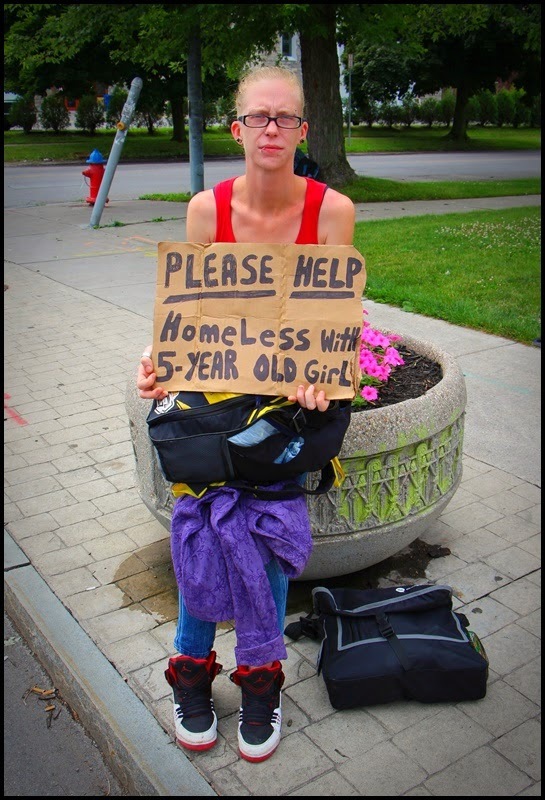 They eat mainly at food pantries and with money she earns on the street. She became homeless after her father–in an alcoholic rage–through her and his grand daughter out in the middle of the night. She has had difficulty getting/holding a job because she suffers from crohn’s disease and is concerned about her daughter’s safety. I have always been moved by seeing people on the street. And as a person of faith I literally cannot help but respond. But in my own personal view I am not doing enough. While I believe that all faiths speak the same truth, I call myself a Christian. And to me, being a Christian is not just about going to church on Sunday mornings, it is a call to action. If I truly were to live out the gospel I would have emptied my wallet to Sarah (OK, I nearly did…but trust me it wasn’t much; I rarely have more than a few dollars on me), or I would have helped in other ways. Tonight when I lay my head on my pillow in my own home with a full belly Sarah and her daughter will be in an abandoned home somewhere. And yes, I am fully aware that she and others I have spoken with and given cash to may be making this all up, that they may in fact be asking for money to support a drug or alcohol habit. But then again, maybe they are not. And if they are not I can’t he;p but wonder how I couldn’t be doing more. Because seriously, as you read this, think about it…what if their stories are true. I’ll get off my little soapbox now, but not before I ask you to watch the below video (it’s only a little over a minute long).